If you have a garden in your backyard, you’ve probably imagined sitting around, enjoying time with your family and friends, or just relaxing on a beautiful Autumn day enjoying a good book. And to make this dream into reality, you need a pergola. 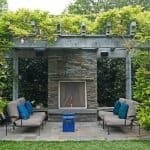 Pergolas are a great solution for areas in your garden. They can provide shade on a sunny day and are also great for creating a beautiful and versatile outdoor space. 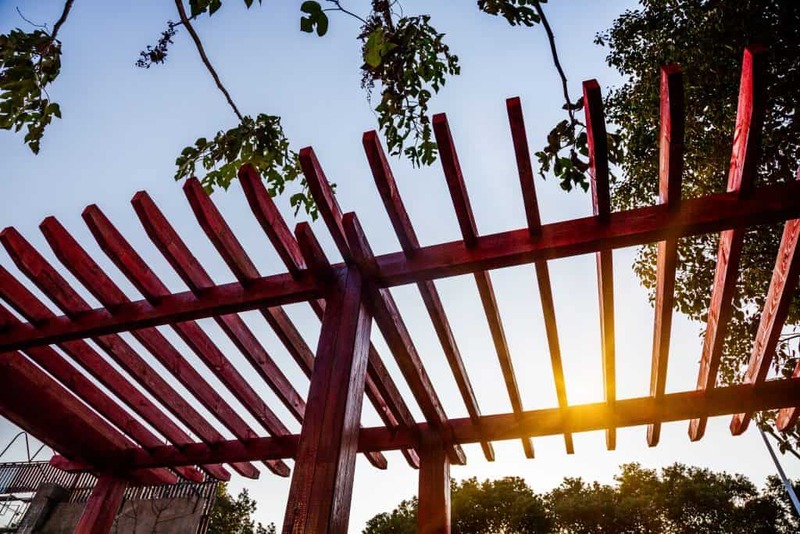 So, if you dreaming about adding a pergola to your garden, here are five different types to help you choose your dream pergola. As official LouvreTec partners, this is one of our favourite options when building pergolas. And we’re sure it will be one of yours too. 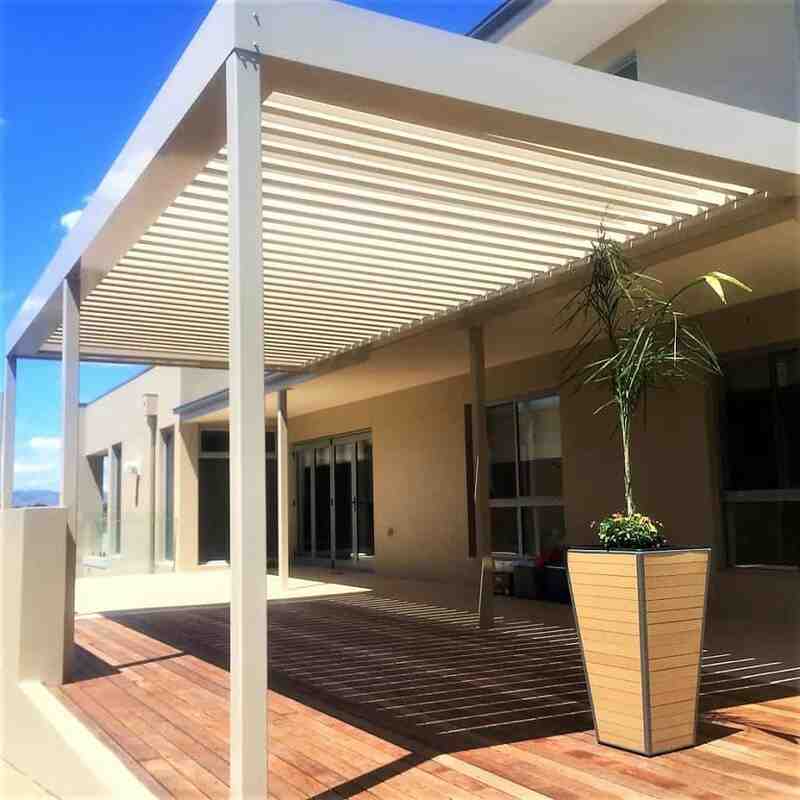 A LouvreTec Pergola will offer you a range of different roofing styles for your pergola. LouvreTec also offers fully engineered structural frame systems that are custom designed for your site. 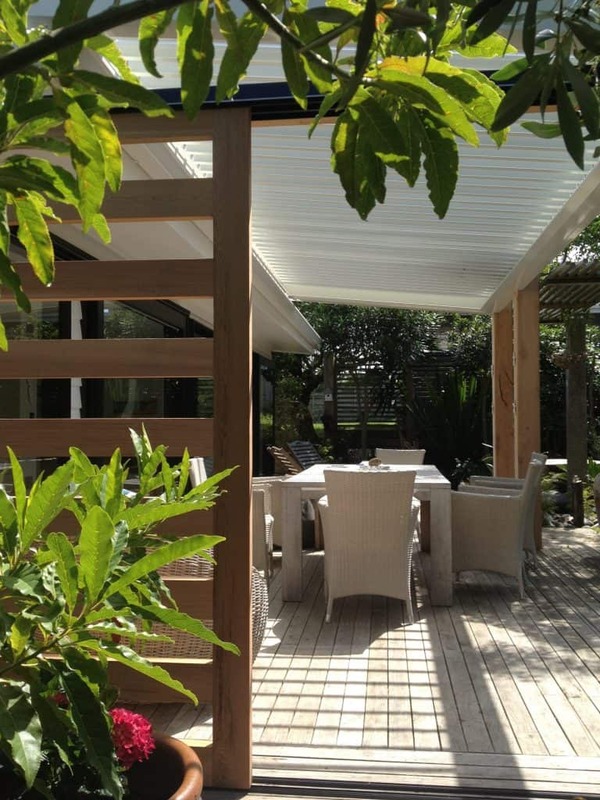 A LouvreTec pergola will give you the best of both worlds – offering sun and shade. A garden arbor can have an operable roof to make it usable in all seasons. Check out our Project of the Month from October 2016 as an example. A garden arbour with operable louvres allows light and breeze control; perfect for our Autumn weather. 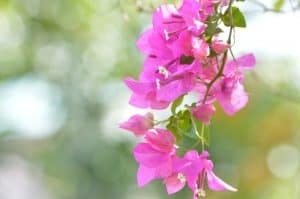 Otherwise, your garden arbor can have a fixed roof that allows sunlight as well as creating shade. 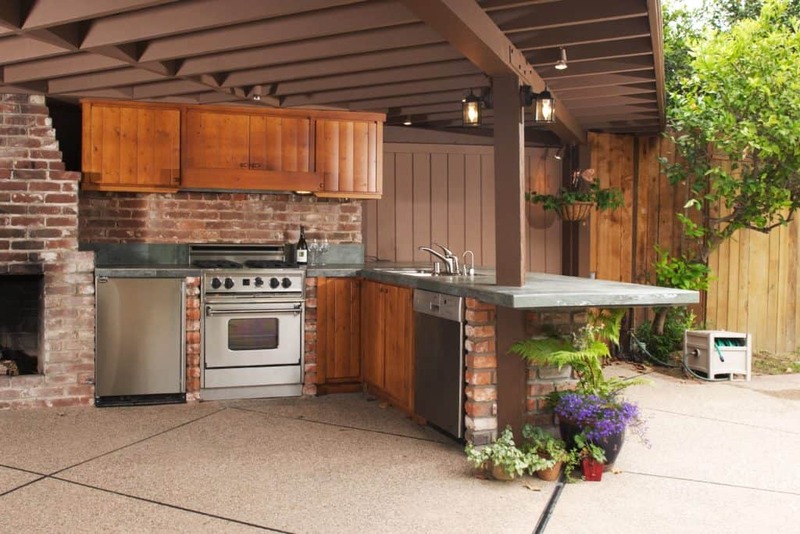 If you love entertaining, then having a pergola with an outdoor kitchen would make life very easy for you. 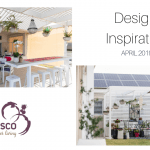 For design inspiration for your outdoor kitchen, watch our September 2019 Design Inspiration video. If you don’t want a covered deck, but still want some shade, adding a pergola over the top of your deck is a great option. Choose a fixed louvre style roof or the more flexible opening roof from LourvreTec. Create an intimate sitting area in the middle of your backyard with a stand-along pergola. You can choose a full-roof option. 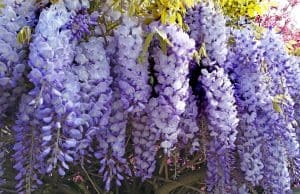 Or go with a fixed louvre style roof option and plant grapevines, or passionfruit vines to create seasonal shade. This pergola combines the two styles. 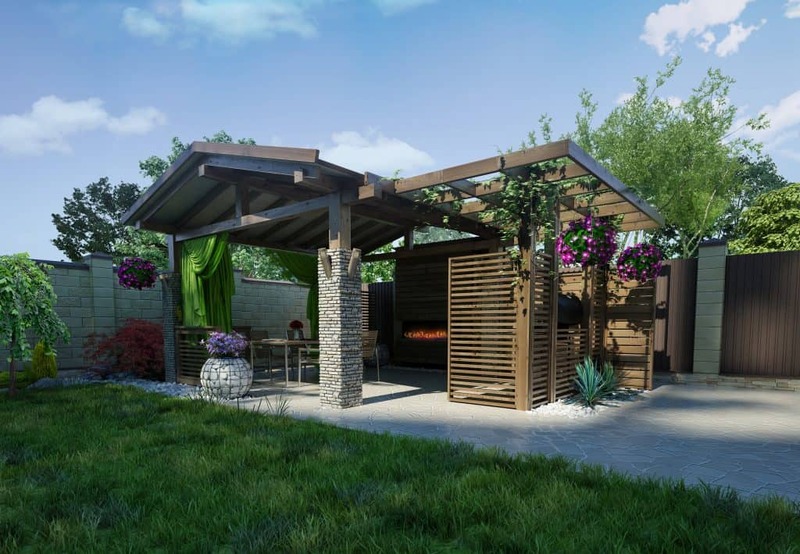 If you are looking for a team to help you create your dream alfresco area, we’re here to help you make your dream pergola a reality. E info@ultimatealfresco.com.au. So, you have decided it’s time to add a gorgeous outdoor space to your home – your very own alfresco. But what comes next – how do you make it all happen? For a summary of the Eight Easy Steps to your Ultimate Alfresco, head to The Process page. Here we’ll take you through a bit more detail about Step 1. Step 1 involves getting a clear idea of what you want and understanding how to maximise your alfresco space. It also involves understanding how you will work with the Alfresco team to make it happen. You might have a vision of what you would like, but can’t see how it would work. Or you might like different aspects of a variety of designs, but don’t know how to pull it all together. Having your own personal design consultation starts you on the process of building the ultimate alfresco area for your home. Step 1 is your Design Consultation Meeting. In this meeting, we listen to your vision, uncover your entertainment and relaxation needs, and discover your alfresco dreams, and then tailor a design to match. You will be taken through a series of questions designed to help you put into words (and then paper) your grand ideas. You will discuss your desired time frame, designs, styles, and budget. Capturing all these details with you at the beginning helps to avoid any confusion down the track, and you have a clear vision of what is going to happen. To complete Step 1, a visit to your home will be arranged to look at your available space and current style of your home. This visit is an important step in developing a clear understanding of what you would like to see and experience in your alfresco area. It helps us understand how we can make your dream alfresco come to life. If you are looking for a team to help you create your dream alfresco area, we’re here to help you make your outdoor dining and entertainment dreams a reality. E info@ultimatealfresco.com.au. Does your outdoor space suit all seasons. Evenings and weekends spent with family and friends… eating, drinking and laughing or just relaxing. Sound familiar? If so, you probably have an outdoor space. Outdoor spaces come in many forms. Yours might be a patio, pergola, gazebo, or deck. You might even have an Ultimate Alfresco outdoor space. The question is – do you use your outdoor space all year around? Traditionally, outdoor areas are used more during the temperate months of the year – early summer and early autumn are usually the favourite months for alfresco use here and around Albury Wodonga. However, designing your outdoor area with a little imagination makes it possible to enjoy your space all year around. 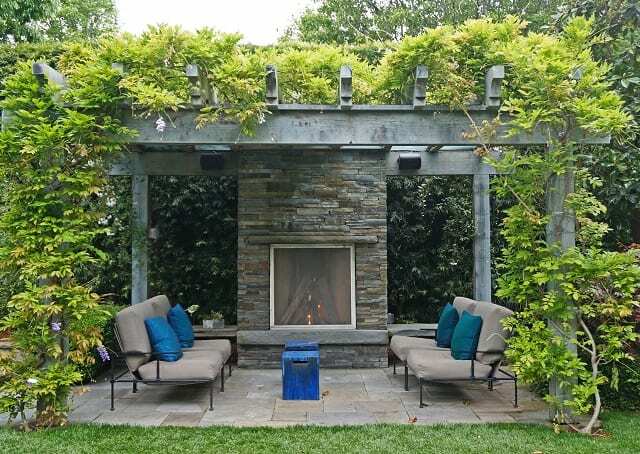 Here are three tips on how to create an outdoor space to suit all seasons. The key to making sure you can use your outdoor area throughout the year is to install some form of shelter. Depending on your preferences, you can choose a range of roofing options, for example, Louvrtec opening roofs can be opened and closed to create shade or let the sun shine through. 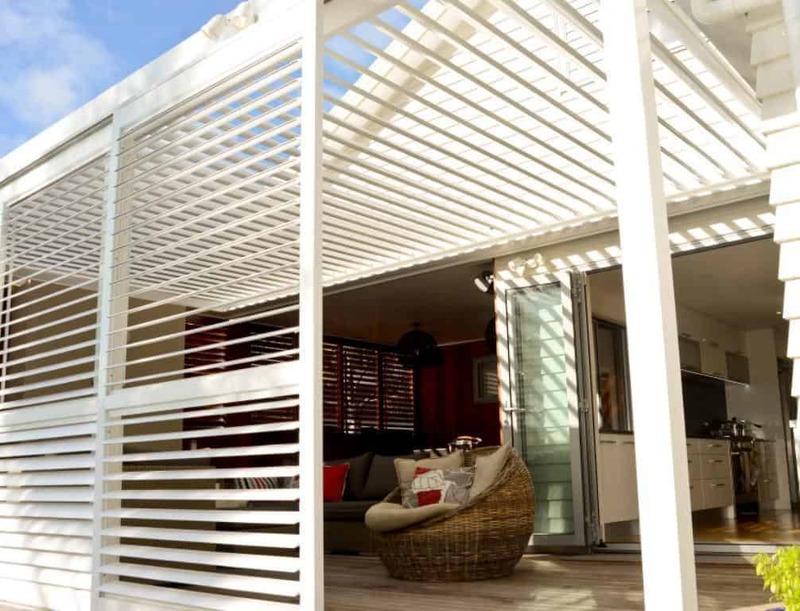 You can also create versatile walls using shutters, louvre panels, outdoor blinds or sliding doors to provide you with screening and ventilation options. 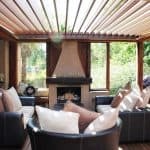 Whatever your choice, creating a sheltered alfresco area will help you to get the most of your outdoor space throughout the year. Australia is a land of extreme temperatures. We regularly get40+º temperatures in Summer and minus temperatures in Winter. And, no-one really wants to be outside in those temperatures…unless you have a climate-controlled outdoor space. 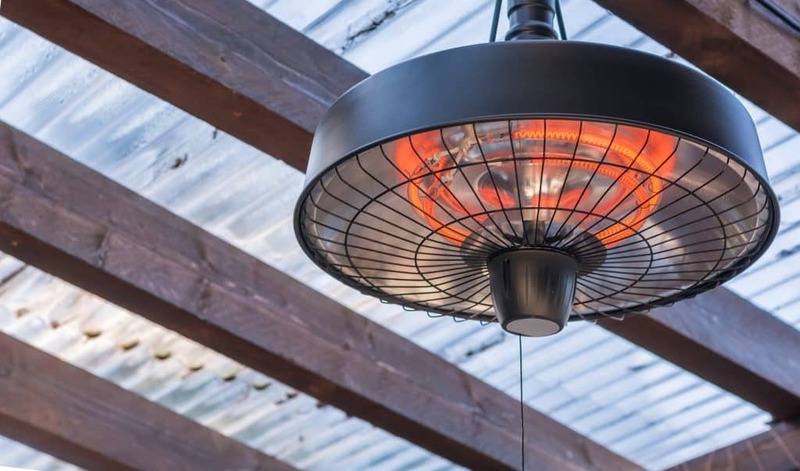 Installing heating and cooling is the best way to counteract these extremes and improve the liveability of your alfresco area. You have a number of options from electric heating and cooling to fireplaces and misting fans, and more. The choice is up to you. You shouldn’t have to head back indoors once the sun goes down. Not when it can be as simple as switching the lights on to keep the party going. Investing in lighting is not only practical but also a great way to create ambiance. Outdoor lighting comes in many different forms and can be both functional and beautiful. Think about what you’d like your alfresco area to feel like. Warm and cosy with a low lighting, or bright and modern with clean bright lights. 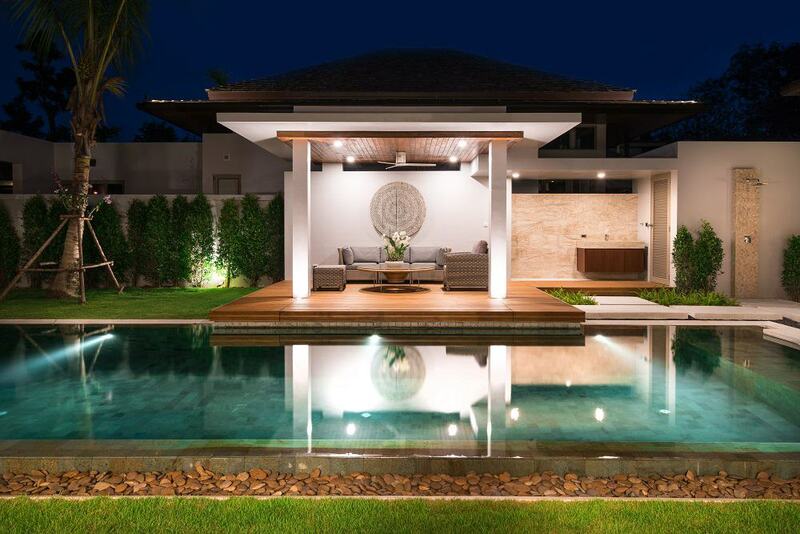 When it comes to lighting ideas consider what would be most appropriate for your outdoor space. And, if you need help, talk to us. Bonus fourth tip – Choose your furniture carefully. Read more about this here. If you need help creating your dream alfresco to suit all seasons, feel free to contact our Alfresco Specialist, Letitia Awdjew. When it comes to designing your outside space there are so many choices. For example, do you choose a patio or a pergola. And what is the difference between the two? 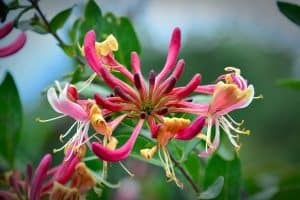 Below we’ve outlined the differences between these two garden features. 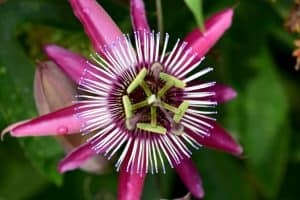 And, we talk about how each one can really bring out the best in your outdoor area. 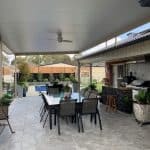 A patio is traditionally designed to expand the usable space of your home, turning your outside space or verandah into an outdoor room, so to speak. Modern patio designs can create a perfect outdoor space for family gatherings, parties or even just for relaxing with a good book. 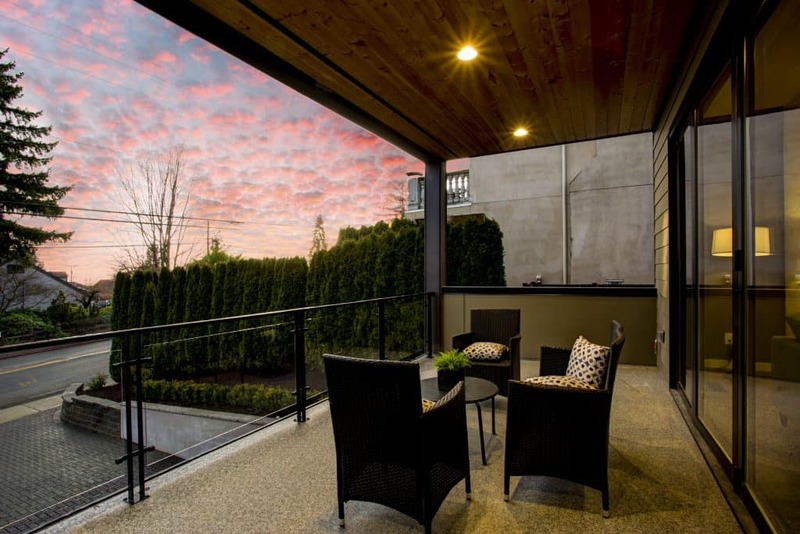 A basic patio is usually directly adjoining the outside wall of your home and has an area of flat, paved ground. 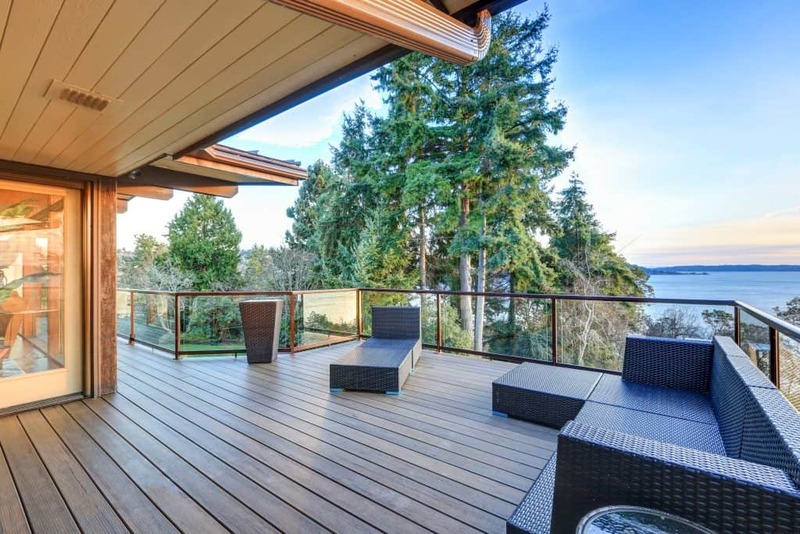 A roof provides shelter and creates that outdoor room feeling. 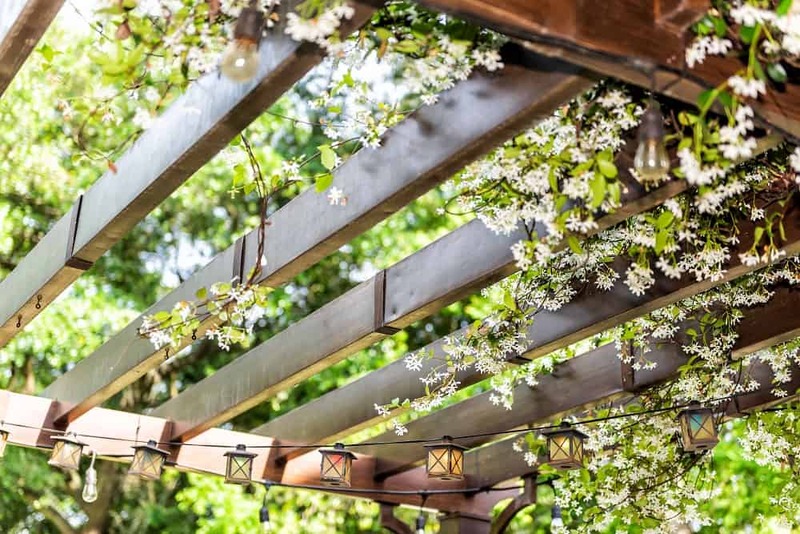 So, how are pergolas different from patios? 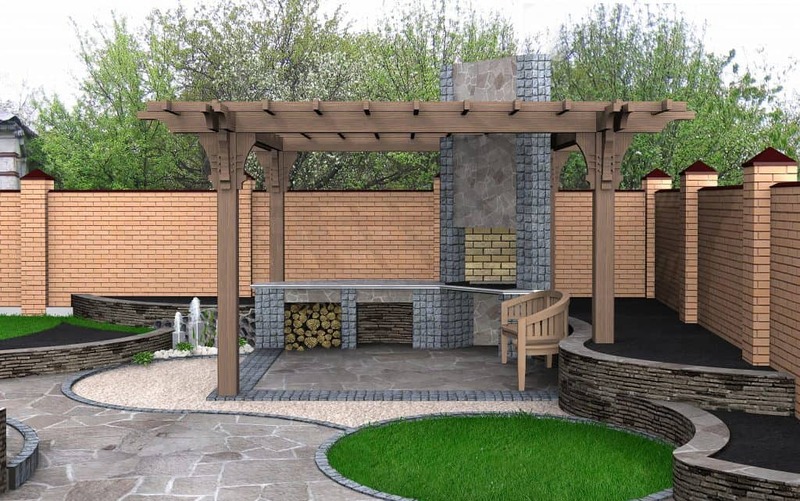 The primary difference between a pergola and a patio is in its purpose. 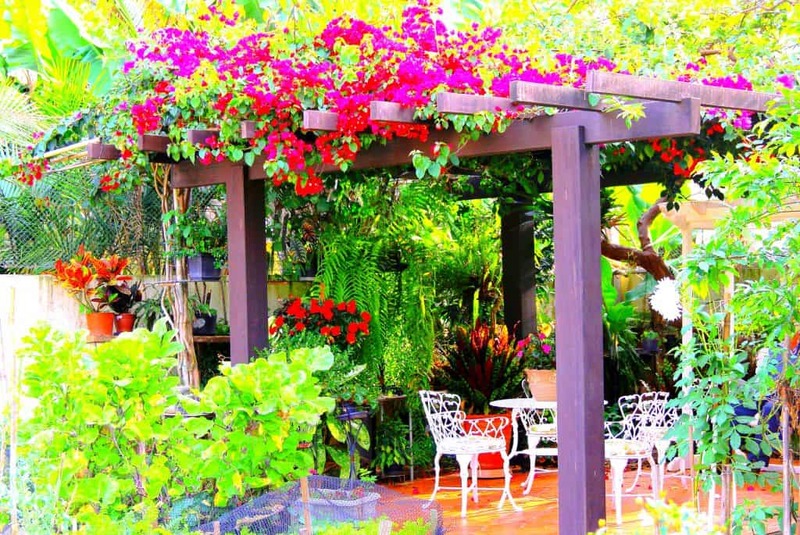 A pergola is designed to be an enhancing feature of your garden. Making it more versatile. Traditionally pergolas are ornamental and designed to enhance the appeal of your garden. A big difference with pergolas is that they are also usually free-standing. In saying this, they can be attached to the wall of your home too. Similar to patios, pergolas can be made as open or as enclosed as you want them to be. If you seek some extra privacy you can add climbing or trailing plants to create a natural partition. A pergola is a great way to extend your living space and to get more out of your garden or outdoor area.